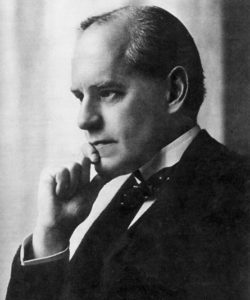 John Galsworthy, the famous author of the ‘Forsyte Saga’, was the son of a City solicitor. He joined Chambers in 1894 at the age of 26. In those days a young barrister had to wait a long time for work and in one of his later novels, ‘In Chancery’ (1920), Galsworthy made a rather ironical reference to this when describing how Soames Forsyte, a solicitor and the central character of many of his novels, briefed junior counsel (i.e. those who were not QCs). Mr Soames only instructed barristers with established reputations and the junior barrister, Mr Bellby, had to wait for his work. It was something of a mystery to Mr Soames as to how barristers ever managed to establish themselves when initially not instructed by clients because of their inexperience. While waiting for briefs at 3 Paper Buildings (as Chambers was known then), Galsworthy took to writing fiction. In 1897 he had a collection of short stories, ‘From the Four Winds’, published under a pseudonym. The first novel of the Forsyte Saga, ‘The Man of Property’, was published in 1906.